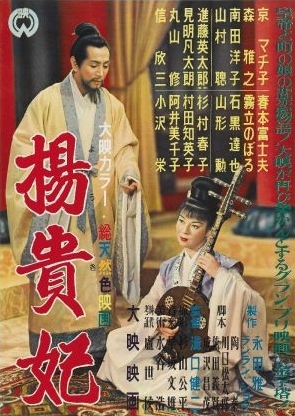 A beautiful scullery maid (Machiko Kyo) becomes the wife of the Emperor (Masayuki Mori) in 8th century Japan, and must sacrifice herself for the sake of his honor. This “rare color film by Kenji Mizoguchi” — a Japanese Cinderella story based on historical legend — features a touching cross-class romance, colorful scenery, and a befittingly tragic ending. Princess Yang Kwei Fei — beautiful, selfless, noble, and “equally at ease in a palace or mingling with the common people” — is the epitome of womanhood in director Kenji Mizoguchi’s eyes, and is treated with sympathetic idealism. While not as indispensable as Mizoguchi’s Sansho, the Bailiff (1954), Ugetsu (1953), or The Life of Oharu (1952), this lovely historical fairy tale is very much worth watching. No, but it’s highly recommended. Not a waste of time, but not a must. This story of romantic love and political unrest picks up momentum as it moves along and, thus, will probably maintain the interest of those particularly intrigued by classic Japanese cinema. At just under 90 minutes, there’s not much ‘fat’ on it, so it never bogs down. It’s also a touch more action-oriented than one expects from Mizoguchi and his signature sensitivity is a bit more on the back burner. Though somewhat soundstage-bound (with the feel of a stage performance, esp. early on), ‘Princess…’ is beautifully filmed in color; production/costume design is very pleasing to look at throughout. And, yes, the scene in which Kyo encourages Mori to be like one of the commonfolk and walk with her through the village streets during New Year’s festivities is a gently unexpected highlight.